Applicant Services Program Specialists are in Woodbury to assist Cannon County residents this week. The group, clockwise from left, includes DRC Manager Eugene Beccue, Stacey Bluford, Joy Shannon and Stacey Bluford. Assistance is available for residents of Cannon County who suffered storm-related damages between April 30 and May 18 and the Federal Emergency Management Agency (FEMA) is working diligently to get the word out. One of those means is through a mobile disaster recovery center (MDR) being operated in Cannon County Tuesday, Wednesday and Thursday of this week, according to Carol Denniston with FEMA Community Relations. The MDR is located at the Community Center and Headstart Building in Woodbury. It is in operation until 7 PM Tuesday, and will be open from 8 AM until 7 PM Wednesday and Thursday, according to DRC Manager Eugene Beccue. Residents seeking assistance, or inquiring as to whether they qualify, should call 1-800-621-3362 if they are unable to visit the MDRC, Denniston said. Denniston said FEMA has had a team in Cannon County going door-to-door, checking with businesses and doing everything possible to determine the needs and to assist those who have been hit by storms. 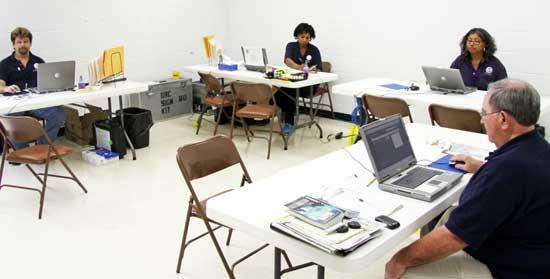 The Mobile Disaster Recovery Centers allow FEMA to travel to counties that have been designated as disaster areas to answer questions about applications and to review information FEMA needs to process applications. Recovery specialists can supply contacts for other programs, according to Beccue. The U.S. Small Business Administration (SBA) also has representatives available to answer any questions about the SBA low-interest disaster loan program for homeowners, renters, businesses of all sizes and certain private nonprofit organizations. These loans are designed to repair or replace real estate and/or personal property damaged by the storms and flooding. Anyone who receives an SBA application must fill it out and send it back to be considered.